"Boar, You're Cleared Hot! Cleared Hot! Cleared Hot! 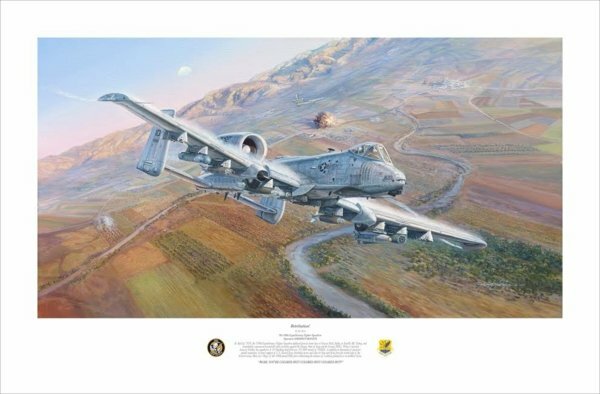 This print features an early morning mission flown by the "Skullbangers" of the 190th Fighter Squadron Idaho Air National Guard. During 2016 the 190th deployed to the Syrian/Iraq theater of operations and immediately commenced around-the-clock airstrikes against ISIS. By the time the 6 month deployment ended, the squadron had fired over 167,000 rounds of 30 MM. In addition the hogs dropped thousands of precision guided munitions in direct support of U.S.-backed forces liberating towns in both Syria and Iraq from the brutal grip of the terrorist army. In this scene two Warthogs are attacking ISIS terrorists targets including a VBIED (vehicle born improvised explosive device) blowing up on a roadway below. The primary Hog in the painting has just smoked a group of terrorist fighters seeking refuge in an orchard below and you can see smoke from ISIS buildings in the village to the North.